Stream network density exerts a strong control on hydrologic processes in watersheds by dictating both the relative importance of terrestrial and aquatic influences to stream chemistry and the residence time of water in watersheds. Knowledge of stream density is critical to modeling and empirical studies aimed at understanding the impact of land use on stream water quantity and quality. Stream network density is largely a function of the number and length of the smallest streams. Many headwater stream reaches are not included in hydrographical maps, such as the U.S. National Hydrography Dataset (NHD), either because they were buried during the course of urban development or because they were seen as smaller than the minimum mapping size at the time of map generation. These “missing streams” severely limit the effective analyses of stream network density based on the NHD, constituting a major problem for many efforts to understand land-use impacts on streams. Examples showing the density and configuration of the streams mapped in this study. Mapped streams are shown in blue compared with the NHD streams (black) for (A) an urban area and (B) a rural area. The study region, covering almost 60,000 km2, includes the Potomac River watershed plus 5 smaller watersheds needed to complete coverage for all of the state of Maryland (USA) west of the Chesapeake Bay. 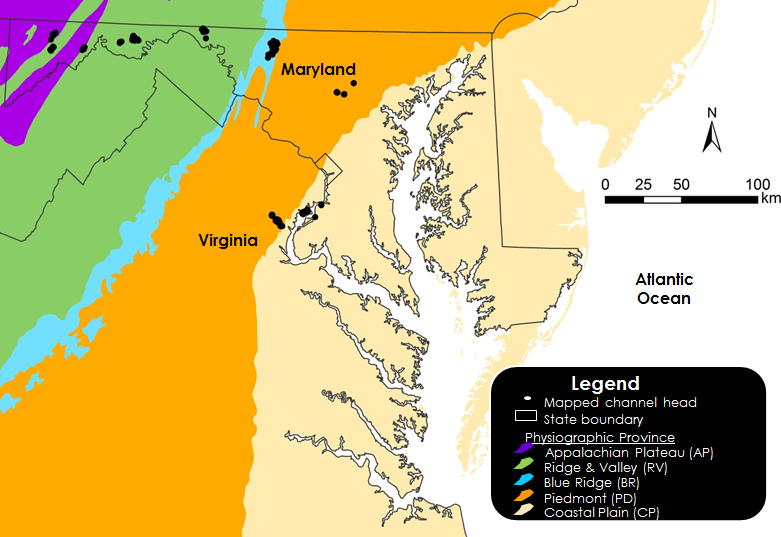 The physiographic setting spans a landscape continuum from the Appalachian Mountains to the Chesapeake Bay spanning considerable geographic and land use diversity, and includes the large metropolitan areas of Baltimore, MD and Washington, DC. The study region includes 5 physiographic provinces, each with distinctive geology and land cover influencing stream network density. We developed a workflow that predicts stream presence and absence by coupling field observations of headwater stream channels with maximum entropy models (MaxEnt) commonly implemented in biogeographical studies to model species distributions. The model utilizes terrain variables that are continuously accumulated along hydrologic flowpaths derived from a 10-m digital elevation model. The distribution of observed streams with respect to the terrain variables with maximum entropy (i.e. the probability distribution that is most uniform) is favored and approximates the probability of stream occurrence. The results show that the NHD under-predicts stream length primarily for catchment areas between 5 and 100 ha. Across physiographic provinces, the heavily dissected Piedmont and Ridge and Valley provinces, wich are covered by highly weathered soils, exhibited the highest stream density. Slightly lower stream densities were found in the groundwater-dominated Coastal Plain, and much lower stream densities were found in the more bedrock dominated Appalachian Plateau and Blue Ridge. Following are stream density maps for HUC12 watersheds in the study region. (A) NHD stream density was more uniform and lower than (B) the stream density calculated from MaxEnt after smoothing, connecting discontinuous segments, and merging with NHD. (C) The percent change in stream density highlights the effects of urban areas and other areas with poor quality NHD stream maps. (D) Spatial variation in stream density can be explained in part by differences in geology between physiographic provinces. Besides regulation and permitting of land use activities, there are many scientific applications for the stream maps generated through this work. For the first time, we have an accurate representation of where streams once flowed through major urban areas of Baltimore and Washington, DC. These data are critical for the quantification of urbanization impacts on aquatic ecosystems and provide a means to quantify the loss and fragmentation of aquatic habitats on par with what has been available for terrestrial habitats for decades. The approach presented here is applicable wherever digital elevation models (DEM) are available and suitable training data can be acquired. Improved stream maps, iteratively updated through field surveys and improved DEMs, are critical to forming sustainable development plans and understanding the functioning of Earth's hydrologic system. As demonstrated through our stream mapping work, changes in watershed land use through urbanization often result in stream burial. Streams get buried when they are directed into culverts, pipes, concrete-lined ditches, or simply paved over. This results in the destruction of natural stream channels and contributes to downstream habitat degradation, aquatic habitat fragmentation, enhanced transport of water and toxic contaminants, and reduction of ecosystem services such as nutrient and sediment retention. Headwater streams are among those most affected by urbanization because they constitute the largest fraction of stream length and are the most economically feasible to bury. 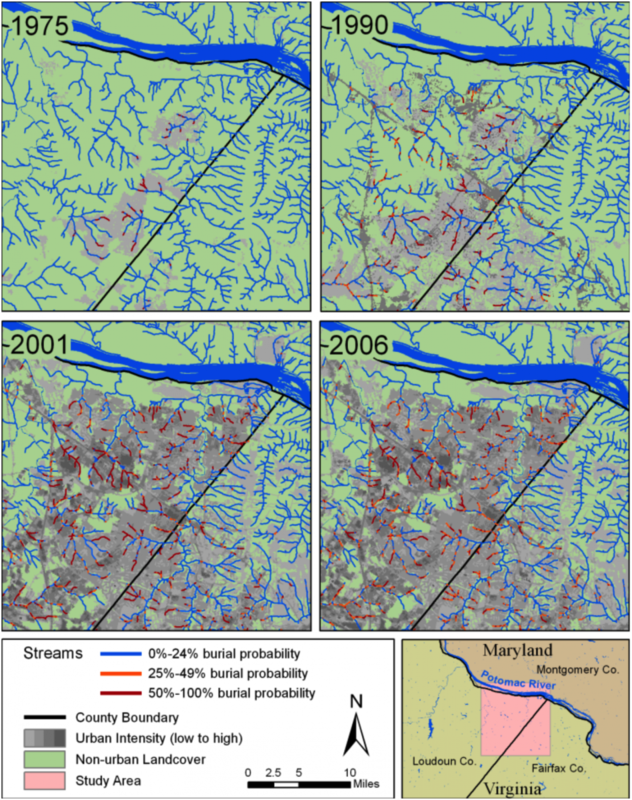 We intersected our new stream map with remote-sensing based observations of stream burial events (training data) and maps of impervious cover (predictive variables), to map the probability of stream burial for the entire study region and found that stream burial rates have increased over time and that stream burial increases with decreasing catchment area. Ongoing research is studying the impact of stream burial on biological connectivity between headwater stream reaches. This website was prepared by the University of Maryland Center for Environmental Science under award (NA05OAR4171042) from Maryland Sea Grant, National Oceanic and Atmospheric Administration, U.S. Department of Commerce. The statements, findings, conclusions and recommendations are those of the author's) and do not necessarily reflect the views of Maryland Sea Grant, the National Oceanic and Atmospheric Administration or U.S. Department of Commerce. Culvert image courtesy of Jane Hawkey, UMCES-IAN.